As technology develops, the way in which we watch video develops too. People no longer settle for just being a passive observer; they want to feel like they are completely immersed in an interactive world. While 3D film technology continues to grow and improve, in the UK we have organisations like Secret Cinema, who build whole environments that have been created to look like a specific film set; Back to the Future, Star Wars and Shawshank Redemption have all been “experienced”, with access to interactive actors, props and transport, giving visitors a deeper, more memorable movie experience. But now there’s something more readily accessible and considerably cheaper. 360 video, also known as panoramic video or immersive video, is still in its infancy, but it is rapidly growing to become the latest development that will have a permanent effect on filmmaking. In a 360 video, you can’t just see what’s in front of the camera, you have the power as an audience to move the video so you can see everything around the camera. Imagine you’re watching a scary movie. On screen you see a girl walking through a dark corridor investigating a strange noise. The camera is following behind her and you have this strong urge for the camera to swing around and show what’s behind it. In the not too distant future this could be a completely possible option. Avicii’s ‘Waiting For Love’ music video was produced with the help of YouTube music legend Kurt Hugo Schneider and shot on the Google Jump rig. Although there aren’t any feature films being made in 360 yet, you can watch an increasing amount of full 360 videos online since YouTube started supporting them in March 2015. If you’re viewing on a desktop computer, you can use your mouse to click and drag the video in the YouTube player any way you want and look in any direction you want. If you are watching a 360 video on your phone all you have to do is move your phone and the camera will pan or tilt with your phone (if your phone has an accelerometer that is). You can experience The Lion King on Broadway, feel like you’re in the crowd at a massive concert, in a formula one racing car or on top of Mount Everest, all without needing to physically be there. Tomorrowland brought out this brilliant video that shows a day at one of their festivals in 360 degrees. To shoot in 360, you need a special rig that can hold a number of identical cameras. You place the cameras in a certain pattern on the rig, so that every inch of the environment you are filming is captured by at least one camera. The lens has to be as wide as possible to make sure the shots overlap (otherwise you cannot stitch the shots together and it won’t make a convincing 360 video). It is then vital that the cameras don’t move individually, as this will ruin the way the images are knitted together. There is however nothing stopping you from moving the entire rig, so you don’t have to stay in one place when you’re filming. The simplest rig has space for 4 cameras, the more intricate rigs can have as many as 16 cameras shooting simultaneously. All cameras have to be set to an identical setting, so all the images have the same look to them (colour, brightness, image quality). The impressive bit happens when processing all the images and editing them together to form one smooth landscape. Luckily there are more and more companies who provide the software to easily convert your footage into a 360 video. There are already quite a few companies out there that provide different rigs for these videos, like Lobster Pictures, Freedom360, 360Heros and Google Jump. The possibilities reach far and wide: you can record almost any experience you can think of and share it with people in an incredibly interactive way; film yourself jumping out of a flying plane, standing on the Pyramid stage at Glastonbury, walking on the Moon or swimming with dolphins, and then pull other people into the water “virtually”. 360 video can be even more immersive, as it can be converted into a virtual reality video by using a special headset. 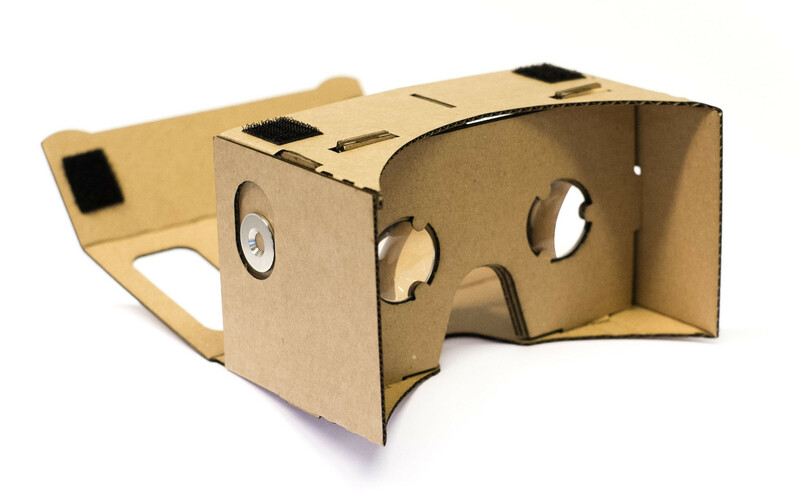 At 2014’s I/O Google introduced Cardboard, an incredibly cheap solution to owning your own virtual reality (VR) headset. As the name suggests, it’s made out of cardboard, which means it is accessible and affordable to a huge number of people.You just put your phone into Cardboard, tap the Cardboard icon on YouTube, which can now play 360 videos in stereoscopic view (a separate video for each eye, both slightly off centre, allowing for your eyes to perceive a 3D view) and voila; you have a VR experience. 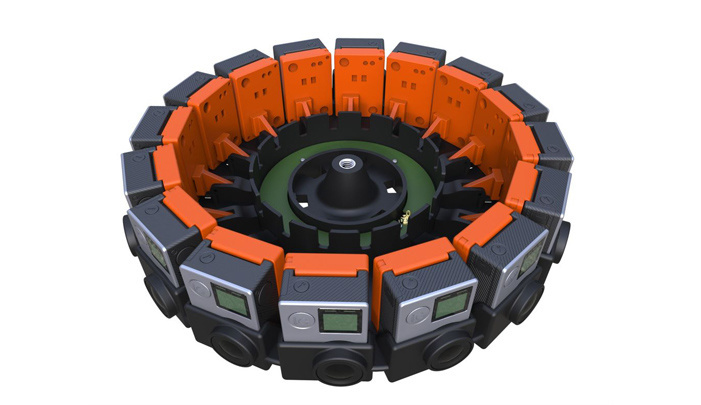 This year Google announced an even more exciting project; they’ve teamed up with GoPro to provide a complete 360 video kit, called Jump. The kit consists out of a circular rig with 16 camera mounts. GoPro provide the cameras and Google provide the processing power and video player (you might have heard of it; it’s called YouTube). Google Jump should be available for the general public towards the end of 2015. At the moment only the more tech savvy can upload a 360 video to YouTube (you have to be able to tell the player to run a Python script to give your footage the right metadata for YouTube to recognise it as a 360 video). YouTube has promised this will become automated so it will be possible for everyone to upload a 360 video without too much trouble. There are also many options for companies to incorporate VR in what they offer their clients. Product demos, educational videos and experiential promos could all be brought to life with interactive 360 video. This year Google announced their plans to make virtual school trips possible. As a teacher you could take your class to Rome, Macchu Picchu or anywhere in the world without leaving the classroom. 360 video opens up a whole new realm in filmmaking. Could we make feature films in 360? Can we allow the audience to decide where they are looking? The logistics of producing a 360 degree film are mind boggling. The director would need to think out every single bit of action and set design. If the viewer can literally see everything, you have to make sure that everything is part of the story and nothing betrays the fact that it is a film. No crew behind the camera, no visible lighting stands or camera dollies. It sounds impossible, but we bet someone will try! Imagine a form of entertainment that’s part film, part theatre and part virtual reality, where the audience have the opportunity to make their own story out of what the director gives them. We’re still working out how you film all this without getting yourself in shot, but in the meantime, we’re going to watch some more 360 degree videos, and listen to some Louis Armstrong. What a wonderful (virtual) world.